Lose Business – Eat BBQ! I managed a dry cleaners during college to help pay the bills. It wasn’t an enviable job, but finding a decent job when there are thousands of other students looking for work isn’t easy. I considered myself lucky just to have the job. It was a back-to-basics customer service kind of work. There were six or seven other dry cleaners on the same road, so being the service leader was vital to staying in business (and keeping my job). I would get to know each customer and have their clothes ready when they pulled up. One night I was called by the owner. He told me there had been a fire and the entire store burned down. This was a real nightmare. You only bring your best clothes to the dry cleaners and now they were burned or smoke damaged – definitely not very clean. The owner, not being the brave one, gave me the job of calling all of the customers and letting them know we lost their good clothes to a fire. I had to get the price they paid for the clothes to give to the insurance company and other information so they could be paid for their loss. On top of that, I had to sit outside the burned ruins of the business and talk with the customers who drove to the store to talk. This was a perfect time to use some of those crisis management skills I had learned. Overall, customers were supportive. I had spent the prior year getting to know them, their families, and the story behind a lot of the stains on their clothes. I had a ready question about their family, work, or vacation when they visited to drop off or pick up clothes, so letting them know how sorry I was that we burned their nice clothes was easier because they also knew me. There were customers who were not so nice. I still vividly recall those people in my mind. The screams of, “How dare you burn my clothes!” and “What are you going to do about this!” were ringing in my ears for weeks after the accident. Once the insurance company paid the claim, things really got moving rebuilding the store and the brand. Think about that for a second. We were going to get back into the same business where just months earlier we had lost all of our customer’s clothes. This was a business that was out of business and sent customers to our competitors. How in the world was I going to attract customers back and keep them after an accident like this? When it came time to reopen the store, I wanted to take some of mystery out of dry cleaning. After all, how do you clean something without getting it wet? I also gave the customers a chance to look around the sparkling clean, new store. I sent invitations to our “Re-Grand Opening” and made it look like a party. We had music playing, toys for the kids, and BBQ sandwiches to eat. I decorated the outside of the store with balloons and streamers and made a sign to hold at the street. Now, I want to mention the BBQ sandwiches again. This was my moment of genius. Since customers are always worried that stains on their clothes would not come out, I made sure to feed them something that was guaranteed to cause stains. Once they dripped that tasty BBQ sauce on their shirt, I would bring them back to the new machines that would remove the stains and show them how it worked. If it was possible, I would use some of the cleaning fluid and remove the stain while they were still wearing the shirt. On top of that, I gave them a coupon with a steep discount to use on their next visit. Customers came back because they could see how nice the store was and that we truly wanted them to come back. I re-instituted the customer service that we were known for and customers even brought new customers. In the end, a fire made things look overwhelmingly dire, but taking advantage of the good customer service I had provided along with a plan to transparent business model gave us a chance to come back stronger than before. A year later, other dry cleaners on that same street started to close. We had taken too many of their customers to keep them going. If you think like a Business Bulldog, there is always a chance to bring your best efforts. You just have to want it, plan for it, and make it happen. An owner thought he was being helpful by showing his desire to help customers. It missed the mark. It is always the execution that we stumble on. We get the right idea with the wrong delivery. 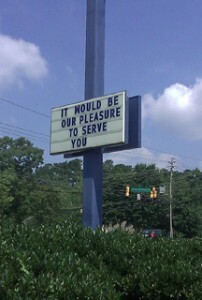 I was passing a sign with the message “It Would be our pleasure to serve you” and had to take the picture. It seems innocuous but, add the word “IF” to the end of the message and you have a whole new meaning. “It would be our pleasure to serve you IF we wanted to or IF we were done with our smoke break” is a sad message to send. Any time you do not make a good, clear point, you lose credibility and putting a bland message out says a lot about who you are. “It is our pleasure to serve you” is a better message, but what does it mean? Why are you wasting prime space on your sign to make a throwaway statement? Step up and sell me something. Be funny or eye catching. Be bad, strange, or thoughtful, but be something that people will remember. That sign I saw made me think they are not worth my time. From the number of cars driving by that had passengers that didn’t even look at the sign, I was right in my analysis. The message you send to customers needs to be as thought out as any big advertising campaign. If you are not making the effort to do something that will draw customers into your store to buy, you are wasting time, money, and effort. Years ago, I saw a tiny doughnut store that was packed. I mean they had people who were getting kind of personal in they way they were crammed into the front of the store. BUT, every one of them was smiling and waiting to spend money. The sign at the front of the store said, “Fresh Doughnuts! If we drop them twice we throw them away!” That was a bad message, but it was memorable. It has been over twenty years since I visited that shop and I still talk about that sign and those doughnuts. Did anyone really think they reused a doughnut that they dropped? Maybe. Did it keep some customers away? Yes. Why is that good? The owners made it a point to target the customer base they wanted. They wanted fun people who would put up with a tiny store and being packed in. I bet you go somewhere that is not up to your standards as an owner, but keeps you coming back because of some bit of character the place created. Never let your message be wasted on blah!